Acute viral infections typically generate functional effector CD8+ T cells (TCD8) that aid in pathogen clearance. However, during acute viral lower respiratory infection, lung TCD8 are functionally impaired and do not optimally control viral replication. T cells also become unresponsive to Ag during chronic infections and cancer via signaling by inhibitory receptors such as programmed cell death-1 (PD-1). PD-1 also contributes to TCD8 impairment during viral lower respiratory infection, but how it regulates TCD8 impairment and the connection between this state and T cell exhaustion during chronic infections are unknown. In this study, we show that PD-1 operates in a cell-intrinsic manner to impair lung TCD8. In light of this, we compared global gene expression profiles of impaired epitope-specific lung TCD8 to functional spleen TCD8 in the same human metapneumovirus–infected mice. These two populations differentially regulate hundreds of genes, including the upregulation of numerous inhibitory receptors by lung TCD8. We then compared the gene expression of TCD8 during human metapneumovirus infection to those in acute or chronic lymphocytic choriomeningitis virus infection. We find that the immunophenotype of lung TCD8 more closely resembles T cell exhaustion late into chronic infection than do functional effector T cells arising early in acute infection. Finally, we demonstrate that trafficking to the infected lung alone is insufficient for TCD8 impairment or inhibitory receptor upregulation, but that viral Ag–induced TCR signaling is also required. Our results indicate that viral Ag in infected lungs rapidly induces an exhaustion-like state in lung TCD8 characterized by progressive functional impairment and upregulation of numerous inhibitory receptors. CD8+ T cells (TCD8) possess critical functions that protect against intracellular pathogens and cancer, including cytotoxicity, cytokine production, and long-lived memory potential (1, 2). During acute infection, naive TCD8 encounter Ag, acquire effector functions, and proliferate to clear the infection, after which 90–95% die whereas the remaining few become memory cells (2). Memory TCD8 can rapidly reactivate their effector functions and proliferate upon pathogen re-encounter, contributing to protective immunity (3). During chronic infection, a different sequence of events occurs: pathogen-specific TCD8 initially acquire effector functions, but they gradually become exhausted and fail to eliminate the infection (4). Proliferation and IL-2 production are lost early, followed by TNF, with IFN-γ production failing weeks into exhaustion (5). Prolonged TCR stimulation by persistent viral or tumor Ags is thought to transcriptionally reprogram exhausted TCD8, resulting in these functional changes (6). The paradigm that acute infection generates functional effector T cells followed by memory development, while chronic infection causes T cell exhaustion, is not generalizable to all infections. During acute viral lower respiratory infection (LRI) in mice, pulmonary TCD8 become functionally impaired, rapidly losing cytotoxicity and cytokine production (7–11). In contrast to exhaustion, lung TCD8 impairment during LRI occurs rapidly, with IFN-γ production waning as early as day 7 (7). Additionally, only TCD8 in the respiratory tract become impaired; TCD8 in lymphoid organs maintain their effector functions, suggesting that the infected lung environment is critical for the development of impairment (12). LRI are typically cleared within 7–12 d even in the face of TCD8 impairment, but the generation of protective immunity may be compromised by the rapid impairment of the primary and secondary anti-viral TCD8 effector responses (13). Failure to generate a quality memory TCD8 response may help explain the ability of respiratory viruses and other pathogens to repeatedly reinfect individuals despite minimal antigenic drift (14–16). A better understanding of the phenotype, functions, and mechanisms controlling lung TCD8 activity during LRI is needed to design new and effective therapeutics and vaccines. We previously uncovered a role for the inhibitory receptor programmed cell death-1 (PD-1) in mediating lung TCD8 impairment during human metapneumovirus (HMPV) and influenza virus infection (12). Blocking PD-1 during LRI resulted in increased TCD8 degranulation, IFN-γ production, and ability to clear the infection. A recent study showed that during respiratory syncytial virus (RSV) infection, PD ligand-1 (PD-L1) expression by lung dendritic cells (DCs) primarily mediated lung TCD8 impairment (17). PD-1 has been proposed to play a role during other acute infections, including rabies (18), histoplasmosis (19), and bacterial sepsis (20, 21). However, PD-1 expression by APCs (e.g., microglia, macrophages, DCs) was found to be primarily important in mediating early susceptibility to these pathogens. Recently, it was shown that PD-1 expression on lung TCD8 correlated with disease severity caused by different strains of influenza virus and PD-1 blockade improved survival, but this was not associated with restored TCD8 functionality (22). Therefore, the intrinsic ability of PD-1 to regulate adaptive immune responses during acute LRI remains unclear. PD-1 blockade restores function to exhausted TCD8 during HIV infection in humans (23) and chronic lymphocytic choriomeningitis virus (LCMV) clone 13 infection of mice (24). PD-1 is not the sole mediator of exhaustion, however, as additionally inhibitory receptors, including TIM-3 (25), LAG-3 (26), 2B4 (27), and others (28), also contribute. The PD-1–mediated functional impairment in both acute viral LRI and chronic systemic infection suggests that additional similarities may exist during these seemingly disparate infections. However, whether additional inhibitory receptors are expressed, what drives their expression, and whether they play a role in lung TCD8 impairment during acute viral LRI are unknown. We addressed these issues by first determining that PD-1 regulates lung TCD8 in a cell-intrinsic manner during HMPV infection. This then allowed us to more directly study the phenotype of impaired lung TCD8. We compared the global gene expression profiles of impaired virus-specific lung TCD8 to unimpaired spleen TCD8 in the same HMPV-infected mice. Gene expression analysis has uncovered numerous pathways regulating effector and memory TCD8 development during acute infection (29) and exhaustion during chronic infection (4, 30). Given the functional differences that exist between effector TCD8 present during most acute infections, exhausted TCD8 during chronic infections, and impaired lung TCD8 during LRI, we hypothesized that each population would possess a unique gene expression profile that may provide insights into the mechanisms governing each functional state. Surprisingly, we found that the lung TCD8 gene expression signature was similar to TCD8 early in the exhaustion process; however, when focusing solely on genes with known immune functions, impaired lung TCD8 were most similar to fully exhausted cells. We confirmed that impaired lung TCD8 coexpress these inhibitory receptors to a greater degree than do spleen TCD8. Finally, we show that TCD8 inhibitory receptor expression is driven by Ag-dependent TCR signaling, and without TCR stimulation, TCD8 remain functional with very low inhibitory receptor expression. Our results indicate that acute viral LRI induces an exhaustion-like state in lung TCD8 characterized by rapid functional impairment and Ag-dependent upregulation of numerous inhibitory receptors. C57BL/6 (B6) and congenic Thy1.1+ mice were purchased from The Jackson Laboratory. B6-Kb0Db0;B7.2 transgenic mice were obtained with permission from Drs. Alexander Sette (La Jolla Institute for Allergy and Immunology, La Jolla, CA) and François Lemonnier (Institut Pasteur, Paris, France). PD-1−/− mice were obtained with permission from Dr. Tasuku Honjo (Kyoto University, Kyoto, Japan). All animals were bred and maintained in specific pathogen-free conditions in accordance with the Vanderbilt Institutional Animal Care and Use Committee. Six- to twelve-week-old age- and gender-matched animals were used in all experiments. Mixed bone marrow chimeric mice were generated by irradiating Thy1.1+ recipients with two doses of 5 Gy, 4 h apart, followed by reconstitution with 1 × 106 wild-type (WT; Thy1.1+) and 1 × 106 PD-1−/− (Thy1.2+) bonemarrow cells 24 h later. Mice were rested for 8 wk and then bled to check reconstitution before use in experiments. HMPV (pathogenic clinical strain TN/94-49, genotype A2) was grown and titered in LLC-MK2 cells as previously described (31). For all experiments, mice were anesthetized with ketamine-xylazine and infected intranasally (i.n.) with 1 × 106 PFU HMPV. Tetramers were generated for the following viral epitopes as previously described (12, 32): HLA-B*0702/M195–203 (M195) (APYAGLIMI), H2-Db/F528–536 (F528) (SGVTNNGFI), and H2-Kb/N11–18 (N11) (LSYKHAIL). Lymphocytes were isolated from spleens and lungs of infected animals and stained as previously described (12). Cells were stained with PE- or allophycocyanin-labeled tetramers (0.1–1 μg/ml), anti-CD8α (clone 53-6.7, BD Biosciences), and anti-CD19 (clone 1D3, iCyt). In some experiments, cells were also stained for the inhibitory receptors PD-1 (clone RMP1-30), TIM-3 (clone RMT3-23), LAG-3 (clone C9B7W), and 2B4 [clone m2B4 (B6)458.1] or with appropriate isotype controls (all from BioLegend). For mixed bone marrow chimera experiments, cells were stained for Thy1.1 (clone OX-7, BD Biosciences) and Thy1.2 (clone 53-2.1, BD Biosciences). Surface/tetramer staining was performed for 1 h at room temperature in PBS containing 1% FBS and 50 nM dasatinib. Intracellular cytokine staining (ICS) was performed in parallel with tetramer staining as previously described (12). Flow cytometric data were collected using an LSR II or LSRFortessa (BD Biosciences) and analyzed with FlowJo software (Tree Star). Boolean gating in FlowJo was used to assess inhibitory receptor coexpression, and patterns were visualized using the SPICE program (National Institute of Allergy and Infectious Diseases). Bone marrow-derived DCs were generated as previously described (12). To obtain secondary M195-specific TCD8, mice were primed i.n. with 2 × 106 M195-loaded, LPS-matured DCs and then challenged with HMPV 3 wk later. For generation of lung-infiltrating vaccinia virus A34R82–90 (A34R)-specific TCD8, mice were immunized i.n. with A34R DCs and then challenged 7 d later with HMPV and were treated daily i.n. during the infection with either 50 μg A34R peptide or an irrelevant HLA-B*0702–restricted peptide. To study splenic TCD8 response to systemically administered Ag, mice were immunized s.c. with A34R-specific DCs, challenged 7 d later with HMPV, and injected daily s.c. and i.p. during the infection with either 50 μg (via each route) A34R peptide or mock peptide. To obtain sufficient quantities of primary epitope-specific TCD8, on day 7 after HMPV infection the spleens and lungs from three mice were pooled together after processing. Samples were stained, sorted, and RNA purified on separate days in independent experiments. Cells were processed in ice-cold R10 media containing 10 nM dasatinib to prevent activation and TCR signaling. Lung cells were processed as before. Splenocytes were depleted of B cells by incubation on goat anti-mouse IgG- and IgM-coated (100 μg/ml) (SouthernBiotech) T-75 flasks at 106 cells/ml for 1 h at 37°C and then processed as before. Both lung and spleen cells were stained for viability, CD19, CD8, and M195 tetramers (both PE and allophycocyanin conjugated). Splenocytes were also stained for CD44 (clone IM-7; BD Biosciences) and CD62L (MEL-14; BD Biosciences) to obtain control naive cells. Dual tetramer+ TCD8 were sorted using a BD FACSAria III. Samples were maintained at 4°C for the entirety of the sort and purity was 97–99% for all populations. Total RNA was isolated from sorted naive, spleen, lung, and secondary lung M195-specific TCD8 using an RNeasy kit (Qiagen) according to the manufacturer’s instructions. On-column DNase digestion was performed, and eluted RNA was quantified and checked for integrity using an Agilent 2100 Bioanalyzer. RNA was amplified using a WT Ovation Pico kit (NuGEN) and then converted to cDNA. Amplified samples were again checked for integrity and then hybridized to mouse gene 1.1 ST microarrays (Affymetrix) and scanned on the GeneTitan instrument (Affymetrix). Microarray data were processed using the oligonucleotide package implementation of rma in R software (33). For microarray analysis, four groups (naive, spleen, lung, and secondary lung) were compared using the limma package (34). Significantly changed probes were identified by ANOVA. The p values were adjusted for multiple comparisons using the false discovery rate (FDR) method (35). The thresholds for significance were set to control the expected FDR at values <10% and the fold-change at 2. HMPV data versus LCMV data. GSE41867 data (26) were downloaded from the National Center for Biotechnology Information Gene Expression Omnibus database. The microarray data files from the present study and GSE41867 were processed separately using the oligonucleotide package implementation of rma in R software. The batch effect of two data sets was corrected using ComBat package (36). In one analysis, five groups (spleen and lung are from the HMPV data set and the additional three groups are from GSE41867 data) were selected to a subset (top 50% based on the coefficient of variation) of the original data and 10 pairwise comparisons were done using the limma package in BioConductor (34). The differentially expressed probes/genes were refined to the gene list based on two criteria: adjusted p value <0.1 and fold-change >2. Analysis of similarity was also performed as previously described (37). In a separate analysis, all groups were compared using ANOVA with the same cutoffs for significance and a heat map was generated. Ingenuity Pathway Analysis (http://www.ingenuity.com) was used to compare different biological processes in spleen versus lung TCD8 and to identify all immune genes present in each data set. The microarray data have been submitted to the Gene Expression Omnibus database (http://www.ncbi.nlm.nih.gov/gds) under the accession number GSE53349. Comparisons between tetramer staining and ICS within the same animals were performed using a paired t test or Wilcoxon signed rank test. Comparisons between two independent groups were performed using an unpaired Student t test or Wilcoxon rank sum test. Multiple group comparisons were performed using one-way ANOVA with a Bonferroni posttest for comparison of individual groups. A p value <0.05 was considered statistically significant by convention. All p values should be for two-sided tests and unadjusted for multiple comparisons unless otherwise noted. Error bars on each graph represented the SEM unless otherwise noted. All analyses were conducted using R software version 2.16. All animals were maintained in accordance with the National Institutes of Health Guide for the Care and Use of Laboratory Animals and were handled according to protocols approved by the Vanderbilt University subcommittee on animal care (Institutional Animal Care and Use Committee). We have previously shown that blockade or genetic ablation of PD-1 reverses functional impairment (12). However, it was unclear whether PD-1 caused impairment via direct signaling on the TCD8 surface or whether its effects were indirectly mediated by other immune cells. To answer this question, we generated WT:PD-1−/− bone marrow chimeric mice. After reconstitution of irradiated recipients with either 1:1 WT (Thy1.1+):PD-1−/− (Thy1.2+) donor bone marrow cells (Fig. 1) or 4:1 WT:PD-1−/− cells (not shown), the TCD8 compartment consisted of approximately twice as many PD-1−/− as WT cells (Fig. 1A). This was true in both the preinfection blood and the postinfection lung compartments (Fig. 1A), indicating a stable ratio of WT:PD-1−/− T cells following HMPV infection. We quantified the total F528 and N11 epitope-specific TCD8 response on day 7 postinfection (p.i.) via tetramer staining, and in parallel their effector functions via brief peptide restimulation followed by intracellular cytokine staining. We have previously shown that direct comparison of these assays allows for the accurate quantification of the functionality of epitope-specific lung TCD8 in a manner that is not influenced by variations in lung APCs or in vitro stimulation conditions (12, 13, 38). The percentage of tetramer+ TCD8 was greater among PD-1−/− cells (Fig. 1B), likely reflecting the increased precursor frequencies due to greater overall numbers of cells. More importantly, we observed greater frequencies of degranulating (i.e., CD107a+) or IFN-γ–producing PD-1−/− versus WT TCD8. To control for the greater overall TCD8 response by PD-1−/− cells, we calculated the percentage of TCD8 capable of degranulating or making IFN-γ and compared WT and PD-1−/− cells within the same mouse. Lung TCD8 were more functional in PD-1−/− compared with WT cells for both epitopes and both effector functions measured (Fig. 1C). WT TCD8 remained impaired in this experiment despite the presence of PD-1−/− hematopoietic cells of different lineages, namely APCs such as DCs. Therefore, these data show that PD-1 functions in a cell-intrinsic manner to impair lung TCD8 during viral LRI. Given the cell-intrinsic nature of PD-1–mediated lung TCD8 impairment, we reasoned that a more thorough examination of anti-viral TCD8 might reveal other mechanisms regulating their function in the respiratory tract. We previously showed that HMPV-specific TCD8 in different environments within the same infected mouse have different levels of functionality (12). We found that HMPV-specific lung TCD8 rapidly lose the ability to produce IFN-γ (Fig. 2A) or degranulate (not shown), although these effector functions are maintained in the spleen over time. HMPV is cleared from the lungs by day 10 (12), yet TCD8 exhibited progressive functional decline long after infection. Secondary lung TCD8 are also highly impaired in their ability to degranulate or make cytokines following challenge of previously infected mice or mice immunized with HMPV-specific class I–restricted epitopes (12, 13). We hypothesized that the infected lung environment influences TCD8 functionality at a transcriptional level to balance the need for viral control with prevention of immune-mediated pathology. To test this, we compared global gene expression differences between virus-specific, impaired lung TCD8 and functional spleen TCD8 from the same HMPV-infected mice. We infected B6-Kb0Db0;B7.2 transgenic mice, in which TCD8 only recognize epitopes restricted by the human MHC class I molecule HLA-B*0702 (39). The TCD8 response in B6-Kb0Db0;B7.2 transgenic mice is dominated by cells recognizing the M195 epitope, which accounts for ∼60% of anti-viral TCD8 (12). At day 7 p.i., the time at which lung TCD8 impairment begins (Fig. 2A), we sorted spleen and lung M195-specific TCD8 as well as secondary lung M195-specific TCD8 from mice primed with M195-loaded DCs then challenged with HMPV. M195-specific TCD8 were sorted to high purity (Fig. 2B) and gene expression analysis was performed. Two samples were deemed outliers based on principal component analysis and excluded from further study (Supplemental Fig. 1). We quantified the gene expression differences of these populations and compared them to naive TCD8 to make direct comparisons between the three groups. Approximately 900 genes were up- or downregulated by all three populations of M195-specific TCD8 compared with naive TCD8 (Fig. 2C), which reflect many genes associated with T cell activation and differentiation (Table I). More than 1300 genes were differentially expressed by both primary and secondary lung TCD8 (Supplemental Table I). Despite large numbers of overlapping genes between these groups, each population contained numerous genes uniquely identifying them: 173 for spleen, 319 for primary lung, and 652 for secondary lung TCD8 (Fig. 2C). A total of 370 genes differed between the impaired lung and unimpaired spleen TCD8 from the same infected mice, indicating that lung anti-viral TCD8 exhibit a unique gene expression profile while combating infection. Activated spleen and lung TCD8 up- and downregulated numerous genes compared with naive TCD8 (Fig. 3A, Table I) in concordance with previous studies (29, 40). Some of these genes were shared by both spleen and lung TCD8, but lung TCD8 also upregulated numerous unique genes. Gene clustering demonstrated that primary and secondary lung TCD8 were most closely related, with numerous additional genes only expressed during challenge infection (Fig. 3A). To broadly compare which biological processes were altered in lung compared with spleen anti-viral TCD8, we performed gene ontology analysis (Fig. 3B). Numerous pathways were substantially altered in primary lung TCD8; “cellular function and maintenance” was the most significantly changed. Other pathways with known immune functions were altered in lung TCD8, including “hematological system development and function,” “immune cell trafficking,” “inflammatory response,” and “cell death and survival.” Genes were then sorted by functional classification and biological process so that just the subset of immune genes could be compared. This analysis revealed that spleen TCD8 very closely resemble naive TCD8, indicating a state of immune immaturity (Fig. 3C). Conversely, lung TCD8 upregulated the expression of dozens of additional immune genes, suggesting that lung-homing virus-specific TCD8 adopt a significantly more differentiated state to combat viral infection. These results indicate that lung TCD8 are immunologically more mature than spleen TCD8 and display a distinct gene expression profile. Several genes encoding inhibitory receptors, which can contribute to T cell exhaustion during chronic infection, were highly expressed by impaired lung TCD8 (Fig. 3C, Table I). These genes encode the receptors TIM-3 (Havcr2), LAG-3 (Cd233), and 2B4 (Cd244). Pdcd1, the gene that encodes PD-1, was not differentially expressed between spleen and lung TCD8, which may reflect either recent activation of spleen TCD8 or migration from the infected lung where they had encountered Ag. FGL2, an inhibitory molecule expressed by regulatory T cells that has been shown to inhibit adaptive immunity (41) and also promote T cell exhaustion during chronic LCMV infection (42), was also highly upregulated by lung TCD8. Interestingly, other known inhibitory receptors, such as CTLA-4, CD160, and BTLA, were not different between any of the groups. The activating receptors OX40 and 4-1BB were upregulated in the lung compared with the spleen, but not as dramatically. Of note, many genes encoding adhesion molecules, cytokines, chemokines, and various others were also significantly different (Supplemental Table I, Table I). In summary, impaired lung TCD8 displayed coordinated upregulation of several genes associated with T cell exhaustion. Functional impairment in association with upregulation of inhibitory receptors has also been observed in exhausted TCD8 during chronic infection. However, important differences exist, including the speed with which lung TCD8 impairment versus exhaustion develops (days versus weeks). We sought to determine whether impaired lung TCD8 resemble exhausted T cells at a global transcriptional level by comparing the gene expression differences of lung TCD8 during acute viral LRI to functional effector TCD8 during acute LCMV Armstrong (Arm) infection as well as exhausted TCD8 during chronic LCMV clone 13 (Cl-13) infection (30). We found that anti-HMPV spleen and lung TCD8 gene expression differed by 257 genes (R = 0.70) in this analysis, whereas anti-LCMV TCD8 at day 8 during Arm infection and day 30 during Cl-13 infection differed by 337 genes (R = 0.43) (Fig. 4A). Interestingly, anti-HMPV lung TCD8 differed by only 34 genes compared with anti-LCMV TCD8 at day 8 during Cl-13 infection (R = 0.48), which increased to 161 genes at day 30 p.i. (R = 0.63). Compared to effector TCD8 at day 8 after Arm infection, anti-HMPV lung TCD8 differed by 83 genes (R = 0.31) whereas anti-HMPV spleen TCD8 differed by only 5 genes (R = 0.06). These results suggest that impaired lung TCD8 gene expression most closely resembles exhausted TCD8 early during chronic infection. In a separate analysis, we compared each TCD8 population based on patterns of gene expression. This experiment also revealed that lung TCD8 most closely resemble TCD8 early during Cl-13 infection (day 8 p.i. ), followed by functional effectors during Arm infection (Fig. 4B). However, each LCMV group differentially regulated numerous genes compared with lung TCD8. The number of genes differentially expressed in these groups was similar to what we found when comparing the groups head-to-head, which showed that lung TCD8 exhibited gene regulation patterns with features of both early CL-13 and late Cl-13 (Fig. 4C). Out of the total gene set for this analysis, we next compared only the genes with known immune functions. We found that anti-HMPV lung TCD8 most closely resemble exhausted anti-LCMV TCD8 at day 30 after Cl-13 infection (Fig. 4D). In this analysis, anti-HMPV spleen TCD8 were more closely related to D8 Cl-13 and Arm TCD8. Of note, when comparing all genes or just immune genes, anti-HMPV lung TCD8 also uniquely express numerous genes that are not shared by any of the other populations (Fig. 4B, 4C, Supplemental Table II). These results indicate that lung TCD8 global gene expression closely resembles TCD8 that are destined to become exhausted (day 8 Cl-13), whereas the lung TCD8 immunophenotype most closely resembles fully exhausted TCD8 (day 30 Cl-13). 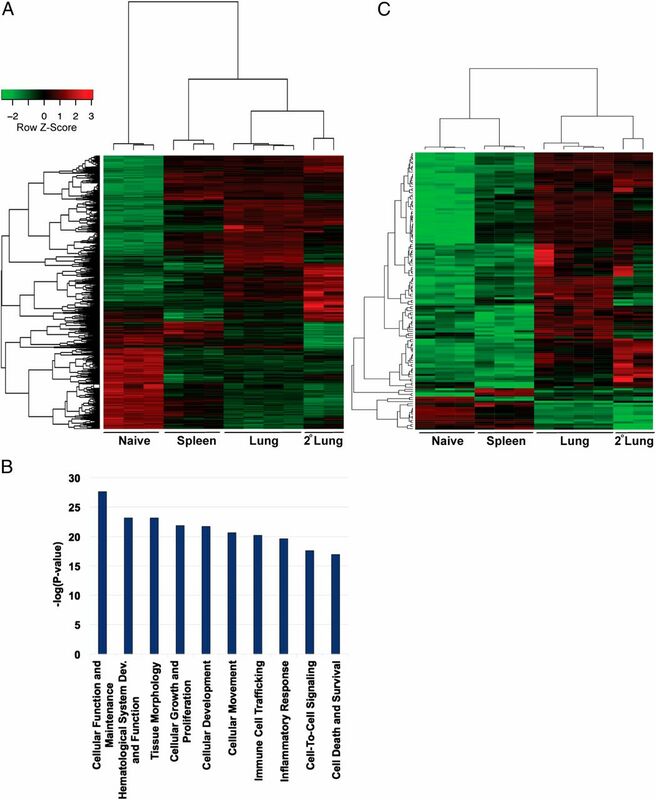 Therefore, the infected lung environment rapidly induces a transcriptional state associated with exhaustion in lung TCD8. To confirm that increased inhibitory receptor gene expression during acute LRI corresponds to increased cell surface expression, we performed flow cytometric analysis of lung and spleen M195-specific TCD8 at day 7 after HMPV infection. Despite similar Pdcd1 mRNA levels (Table I), surface PD-1 expression was greater on lung TCD8 at day 7 (Fig. 5A). The same was true for TIM-3 and LAG-3. 2B4 expression was also higher in the lung. Additionally, we found considerable coexpression of these inhibitory receptors on lung TCD8, with most lung TCD8 expressing two or more inhibitory receptors by day 7 p.i. ; in contrast, most splenic TCD8 expressed one or no inhibitory receptors (Fig. 5B). Thus, impaired lung TCD8 are associated with the coexpression of multiple inhibitory receptors. Ag-induced TCR signaling is associated with PD-1 upregulation during chronic infections (23, 24, 43, 44). To determine whether viral Ag is necessary for lung TCD8 impairment and inhibitory receptor upregulation, we took advantage of the fact that i.n. DC immunization elicits unimpaired, PD-1low TCD8 directly in the lung (12). We immunized mice i.n. with LPS-maturated bone marrow–derived DCs loaded with the vaccinia virus–derived epitope A34R, challenged them with HMPV a week later, and delivered cognate A34R peptide i.n. to induce TCR signaling or a control (mock) HLA-B*0702–restricted peptide (Fig. 6A). Of note, mice receiving mock peptide did not lose weight during the infection (HMPV does not cause clinical disease in mice), whereas those receiving A34R peptide lost nearly 25% of their body weight (Fig. 6B). The endogenous M195 response was greatly diminished in A34R-treated mice and so was not included in the following analysis. 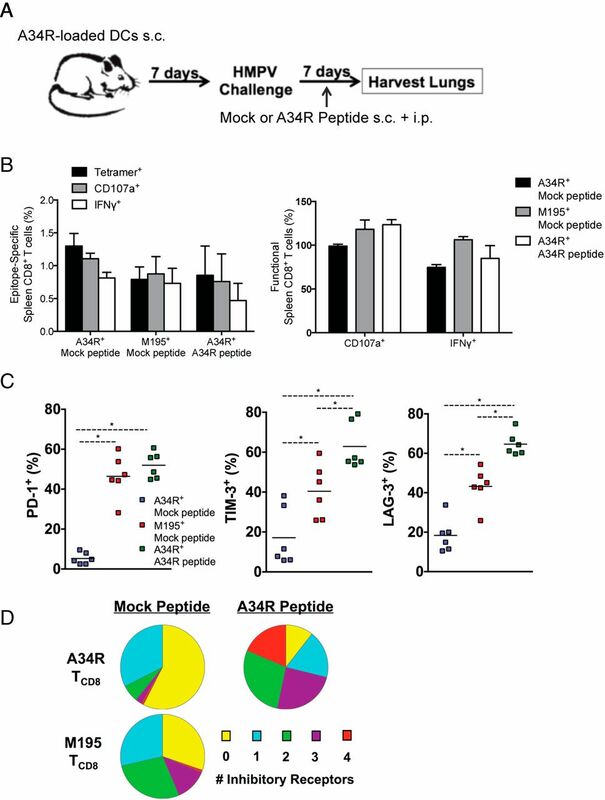 Heterologous A34R-specific TCD8 in mice receiving mock peptide were minimally impaired, whhereas M195-specific TCD8 in the same infected lungs were impaired (Fig. 6C). In contrast, A34R-specific TCD8 in mice receiving cognate peptide expanded in number but were severely impaired (Fig. 6C). Compared to M195-specific cells, fewer A34R-specific TCD8 in mock-treated mice expressed PD-1, TIM-3, LAG-3 (Fig. 7A), or 2B4 (not shown). However, A34R-specific TCD8 expressed very high levels of inhibitory receptors in mice treated with cognate Ag A34R peptide (Fig. 7A). Furthermore, in the mock peptide–treated mice, inhibitory receptor coexpression was low in A34R-specifc TCD8 (Fig. 7B), with most cells expressing one or no receptors. A34R-specific TCD8 in A34R peptide–treated mice highly coexpressed all four of the inhibitory receptors we analyzed. Their expression eclipsed that of even the M195-specific TCD8 that also were exposed to the presence of cognate Ag due to HMPV infection. Therefore, the large degree of functional impairment observed in A34R peptide-treated mice (Fig. 6) was associated with a dramatic increase in inhibitory receptor coexpression. Thus, cognate Ag-induced TCR signaling in the context of pulmonary infection promotes lung TCD8 impairment and inhibitory receptor coexpression. To show that this phenomenon is specific to the lung environment, we systemically immunized mice with A34R-specific DCs via the s.c. route and then injected them daily s.c. and i.p. with either A34R or mock peptide during HMPV infection (Fig. 8A). In mice treated with either mock or A34R peptide, the A34R-specific spleen TCD8 were equally functional as measured by CD107a mobilization and IFN-γ production (Fig. 8B). Splenic TCD8 specific for the HMPV epitope M195 were unimpaired, as shown previously (12, 45). A34R-specific TCD8 in mice treated with mock peptide had low expression of PD-1, TIM-3, LAG-3, and 2B4 (Fig. 8C and not shown) and most of these cells expressed one or no inhibitory receptors (Fig. 8D). Splenic M195-specific TCD8 treated with mock peptide (but exposed to cognate Ag through HMPV infection) upregulated inhibitory receptor expression despite retaining functionality. However, A34R-specific TCD8 in mice treated with cognate A34R peptide increased expression of PD-1, TIM-3, LAG-3, and 2B4. As in the lung (Fig. 7A), A34R-specific TCD8 in mice treated with Ag A34R peptide expressed higher levels of TIM-3 and LAG-3 than did M195-specific TCD8. Moreover, these cells exhibited substantial coexpression of multiple inhibitory receptors, with 70% coexpressing two or more inhibitory receptors. These results confirm that Ag-induced TCR signaling mediates inhibitory receptor expression, but more conclusively demonstrate that the location of TCD8 in the lung is critical for the development of the exhaustion-like phenotype, because splenic TCD8 remain functional despite Ag stimulation and upregulation of inhibitory receptors. In this study, we sought to further elucidate mechanisms of TCD8 impairment during acute viral LRI and better define the dysfunctional effector state observed in pulmonary TCD8. We first determined that lung TCD8 impairment was cell-intrinsically regulated by PD-1. Importantly, this excluded a role for other PD-1–expressing cell types in mediating TCD8 functional impairment. PD-1 signaling has been shown to affect multiple immune cells (e.g., macrophages and DCs) during other acute infections (20, 21). A TCD8-intrinsic role for PD-1 was suggested by in vitro studies showing that blocking PD-L1 on epithelial cells during RSV infection (46) or microglial cells during coronavirus infection (47) resulted in increased IFN-γ production by memory TCD8. Bone marrow chimeric experiments confirmed an intrinsic role for PD-1 in impairing TCD8 memory development and secondary responses after VACV infection (48). In the present study, we used bone marrow chimeric mice to show that PD-1 cell-intrinsically regulates TCD8 functions during acute viral LRI. The contribution of TCD8-intrinsic PD-1 signaling to viral clearance cannot be assessed using this model, so the possibility exists that PD-1 expression by other immune cells is responsible for the increased viral replication observed in PD-1–expressing mice (12). Several studies have shown that HMPV and RSV infection of DCs impaired the ability of these DCs to prime an effective T cell response; however, none of these studies reported on inhibitory ligand expression by DCs (49–52). We found previously that PD-L1 and other inhibitory receptors are expressed at substantially different levels by different subsets of APCs in the lung, and this expression was partially modulated by type I IFN expression (38). Yao et al. (17) recently reported that during RSV infection, inflammatory DC-derived PD-L1 directly inhibits cytokine production by effector T cells in vitro and in vivo. Thus, inhibitory ligand expression by APCs may contribute to lung TCD8 impairment. However, several lines of evidence support persistence of the intrinsic TCD8 impaired phenotype induced by respiratory virus infection. First, in our initial study describing lung TCD8 impairment, we showed that HMPV-specific lung TCD8 were impaired at numerous time points after infection and after reinfection, whereas splenic TCD8 remained functional at all time points (12). However, mice i.n. immunized with bone marrow–derived DCs did not exhibit lung TCD8 impairment. Additionally, mice infected with HMPV and subsequently challenged with either HMPV or peptide-loaded bone marrow–derived DCs exhibited the same degree of impairment in both groups of mice, indicating that additional DCs could not rescue the phenotype. Genetic ablation or Ab blockade of PD-1 in vivo and in vitro (which did not affect APC numbers) restored TCD8 functionality in the ICS assay (12, 13). Taken together, these data support a cell-intrinsic role for PD-1 in lung TCD8 impairment. We then profiled global gene expression in impaired lung versus unimpaired spleen epitope-specific TCD8 to identify pathways that might explain the stark difference in functionality observed between these two populations. Lung TCD8 exhibited a more diverse pattern of gene expression, suggesting that exposure to viral Ag in the infected milieu drives further differentiation, which was confirmed by subsequent experiments showing the upregulation of inhibitory receptors in response to cognate Ag-induced TCR signaling. 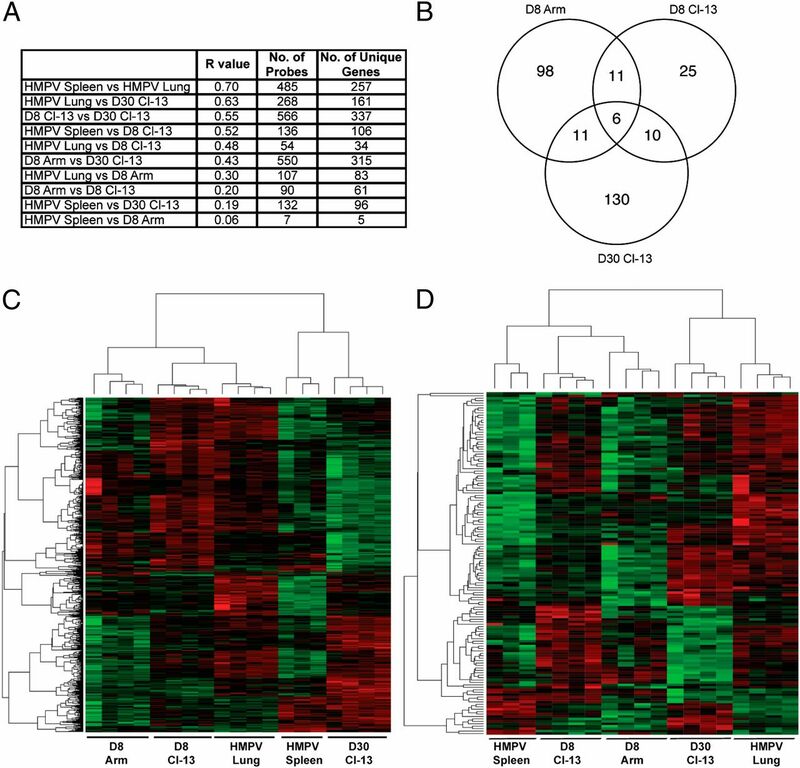 Lung TCD8 exhibited a more diverse pattern of gene expression than did spleen TCD8, expressing an additional 319 genes. They upregulated expression of numerous genes encoding chemokines, including CCL1, CCL3, CCL4, CXCL9, and CXCL15, suggesting a role for lung TCD8 in recruiting other inflammatory cells to the infected lung. They transcribed more Ifng, Tnfa, and Il2 mRNA despite a decreased ability to produce these cytokines, suggesting posttranscriptional regulation of gene expression, which has been observed during exhaustion (4). Recently the transcriptional circuitry that regulates effector, memory, and exhausted TCD8 has been defined (reviewed by Kaech and Cui in Ref. 1). T-bet, which supports effector TCD8 function and prevents exhaustion (53), and Eomes, which promotes exhaustion (54), were not differentially expressed between spleen and lung TCD8 in our study. Fos and Jun, two proteins that form the heterodimeric transcription factor AP-1, were both more highly expressed in lung TCD8. AP-1 was recently described as a transcriptional activator of PD-1 (55) and so may represent a link between Ag-induced TCR signaling and PD-1. The genes encoding transcription factors Id2 and Id3 were more highly expressed in lung TCD8. ID2 supports development of terminal effectors (56) whereas ID3 promotes survival of long-lived memory cells (57). ID2 could contribute during early effector differentiation of lung TCD8, but the contribution of each of these transcriptional regulators to impairment remains to be defined. Additionally, the Prdm1 gene, which encodes the transcriptional repressor BLIMP-1, was upregulated in lung TCD8, whereas BCL-6, which opposes BLIMP-1 activity, was downregulated in both lung and spleen TCD8. During acute infections, high BLIMP-1 expression enhances T cell functions and the formation of KLRG1highIL-7Rlow terminal effectors (58). During chronic infection, BLIMP-1 is highly expressed in association with the upregulation of inhibitory receptors (40). During viral LRI, a role for BLIMP-1 has been described in the generation of IL-10–producing effector TCD8 (60). Given the high expression of inhibitory receptors on lung TCD8, BLIMP-1 in these cells may promote functional impairment, but further experiments are necessary to explore this possibility. Lung TCD8 expression of T-bet, BLIMP-1, AP-1, and ID2 during acute viral LRI all imply an effector phenotype. Indeed, lung TCD8 are effectors that produce cytokines, degranulate, and kill infected cells. However, they rapidly lose these effector functions in conjunction with coordinated upregulation of several inhibitory receptors. These inhibitory receptors temper immune responses in a number of settings (54), and their roles in LRI are not well understood. TIM-3, which is coexpressed by PD-1+ T cells during chronic infections (25) and cancer (61), also impairs T cell responses during acute viral infections (62, 63). 2B4 can be either inhibitory or stimulatory (64), but in the setting of chronic infection it contributes to the rapid impairment of memory TCD8 (27). Lung TCD8 also expressed higher levels of Il10 and Il10ra mRNA. T cells are the primary producers of IL-10 during LRI (65), and it has been proposed that their expression of IL-10R facilitates an intrinsic TCD8 counterregulatory mechanism (60), suggesting that IL-10 may also be a key mediator of TCD8 impairment. However, unlike during chronic infection where IL-10 blockade enables clearance of an established infection (66), blocking IL-10 during acute infection only serves to increase inflammation and not accelerate viral clearance (60), so its application in therapeutic approaches may be limited. Interestingly, we observed a significant overlap in the gene expression profile of impaired lung TCD8 during acute viral LRI and exhausted TCD8 during chronic viral infection. This was especially true when examining genes with known immune functions. Notably, impaired lung TCD8 resemble exhausted cells more than they do functional splenic cells or even effector splenic TCD8 during acute LCMV infection. It is unlikely that lung TCD8 exist in other states of unresponsiveness, such as anergy or senescence, as genes associated with these conditions were not upregulated. Previous reports have also described exhaustion as unique from these states (4). The functional impairment, upregulation of similar inhibitory receptors, and overlapping gene expression profiles shared by lung TCD8 during acute viral LRI and TCD8 during chronic LCMV infection suggest a similar functional state. This has been described as exhaustion, which is secondary to repetitive TCR stimulation during chronic infection and cancer. However, this paradigm may need revising given our results that exhaustion can develop rapidly in the right setting, namely, acute viral infection of an organ with critical importance with regard to survival. A similar functional state of anti-viral TCD8 may exist in acute CNS infections, such as that seen during rabies (18) and coronavirus (47) infection. A key similarity in all these settings is the exposure of TCD8 to viral Ag during infection. However, the degree to which viral Ag alone mediates exhaustion is unclear. It is likely that varying levels of Ag are expressed at different times and in different organs during these acute infections and also during chronic infections. A key future direction will be to explore the factors present in each organ during infection that mediate exhaustion. Understanding these process will allow for more targeted therapies, especially now that PD-1 blockade is being used clinically for cancer treatment. The effects of these treatments may vary widely based on the local environment in the target tissue with differing levels of Ag, inhibitory receptors, immunomodulatory ligands, and cytokines. Whereas the gene expression profile of lung TCD8 shares many similarities with exhausted TCD8, it also preserves a core signature of unique genes. For example, lung TCD8 more highly express the transcription factors ID3, IRF8, and AP-1 than do early effector, early exhausted, or late exhausted TCD8. Some of the unique transcripts may represent networks of genes required to exist in the lung environment, and many of them are immune genes with well-characterized functions. It will be interesting to decipher the role of these and other gene products in enforcing TCD8 impairment versus allowing for control of respiratory virus infections. In summary, we have shown that PD-1 cell-intrinsically regulates lung TCD8 impairment and that lung TCD8 rapidly acquire a gene expression profile resembling the exhausted state observed during chronic infection. Their differentiation state comprises elements of both effector and exhausted T cells that may allow them to balance control of pathogen spread with prevention of immune-mediated tissue damage. We confirmed coexpression of PD-1, TIM-3, LAG-3, and 2B4 by lung TCD8 with a relative lack of these receptors by functional spleen TCD8. Our results indicate that acute viral LRI induces an exhaustion-like state in lung TCD8 characterized by rapid functional impairment and Ag-dependent upregulation of numerous inhibitory receptors. Further exploration of the roles of these inhibitory receptors in T cell impairment may yield novel targets for therapeutics or vaccine strategies against respiratory virus infections. J.V.W. serves on the Scientific Advisory Board of Quidel, which activity has no conflict with the present work. The other authors have no financial conflicts of interest. We thank D. Flaherty, B. Matlock, and K. Weller at the Vanderbilt Flow Cytometry Shared Resource for invaluable assistance with sorting cells and analyzing flow cytometry data. We also thank Drs. A. Sette, F. Lemonnier, and T. Honjo for providing mice used in these experiments. We are grateful to Mark Boothby and Stokes Peebles for helpful discussions of the work. This work was supported by National Institutes of Health Grants AI085062 (to J.V.W. ), AI040079 (to S.J. ), AI042284 (to S.J. ), HL054977, HL121139, and Veterans Affairs Merit Award BX001444 (to S.J. ), and GM007347 (to J.J.E.). The Vanderbilt Medical Center Flow Cytometry Shared Resource is supported by Vanderbilt Ingram Cancer Center Grant P30 CA68485 and by Vanderbilt Digestive Disease Research Center Grant DK058404. This work was also supported in part by the Vanderbilt Clinical and Translational Science Award Grant UL1 RR024975-01 from the National Center for Research Resources/National Institutes of Health. The microarray data presented in this article have been submitted to the Gene Expression Omnibus database (http://www.ncbi.nlm.nih.gov/gds) under accession number GSE53349.
. 2012. Acquired transcriptional programming in functional and exhausted virus-specific CD8 T cells. Curr. Opin. HIV AIDS 7: 50–57.
. 2008. Impairment of the CD8+ T cell response in lungs following infection with human respiratory syncytial virus is specific to the anatomical site rather than the virus, antigen, or route of infection. Virol. J. 5: 105.
. 2006. Functional impairment of cytotoxic T cells in the lung airways following respiratory virus infections. Eur. J. Immunol. 36: 1434–1442.
. 2006. Characterization of the CD8+ T cell responses directed against respiratory syncytial virus during primary and secondary infection in C57BL/6 mice. Virology 352: 157–168.
. 2005. Altered function in CD8+ T cells following paramyxovirus infection of the respiratory tract. J. Virol. 79: 3339–3349.
. 2014. Programmed death-1 impairs secondary effector lung CD8+ T cells during respiratory virus reinfection. J. Immunol. 193: 5108–5117.
. 2011. Human metapneumovirus. Semin. Respir. Crit. Care Med. 32: 447–453.
. 1961. Respiratory syncytial virus. IV. Correlation of virus shedding, serologic response, and illness in adult volunteers. JAMA 176: 663–667.
. 1991. Immunity to and frequency of reinfection with respiratory syncytial virus. J. Infect. Dis. 163: 693–698.
. 2015. Control of pathogenic effector T-cell activities in situ by PD-L1 expression on respiratory inflammatory dendritic cells during respiratory syncytial virus infection. Mucosal Immunol. 8: 746–759.
. 2008. Detrimental contribution of the immuno-inhibitor B7-H1 to rabies virus encephalitis. J. Immunol. 180: 7506–7515.
. 2008. The PD-1/PD-L costimulatory pathway critically affects host resistance to the pathogenic fungus Histoplasma capsulatum. Proc. Natl. Acad. Sci. USA 105: 2658–2663.
. 2009. PD-1 on dendritic cells impedes innate immunity against bacterial infection. Blood 113: 5811–5818.
. 2009. PD-1 expression by macrophages plays a pathologic role in altering microbial clearance and the innate inflammatory response to sepsis. Proc. Natl. Acad. Sci. USA 106: 6303–6308.
. 2014. Highly pathological influenza A virus infection is associated with augmented expression of PD-1 by functionally compromised virus-specific CD8+ T cells. J. Virol. 88: 1636–1651.
. 2011. Tight regulation of memory CD8+ T cells limits their effectiveness during sustained high viral load. Immunity 35: 285–298.
. 2009. Synergistic reversal of intrahepatic HCV-specific CD8 T cell exhaustion by combined PD-1/CTLA-4 blockade. PLoS Pathog. 5: e1000313.
. 2002. Molecular and functional profiling of memory CD8 T cell differentiation. Cell 111: 837–851. 2005. The cotton rat (Sigmodon hispidus) is a permissive small animal model of human metapneumovirus infection, pathogenesis, and protective immunity. J. Virol. 79: 10944–10951.
. 2013. Discovering naturally processed antigenic determinants that confer protective T cell immunity. J. Clin. Invest. 123: 1976–1987.
. 2007. Exploration, normalization, and genotype calls of high-density oligonucleotide SNP array data. Biostatistics 8: 485–499. 2004. Linear models and empirical Bayes methods for assessing differential expression in microarray experiments. Stat. Appl. Genet. Mol. Biol. 3: 1–25.
. 2007. Adjusting batch effects in microarray expression data using empirical Bayes methods. Biostatistics 8: 118–127.
. 2012. Distance-based multivariate analyses confound location and dispersion effects. Methods Ecol. Evol. 3: 89–101.
. 2015. Role of type I interferon signaling in human metapneumovirus pathogenesis and control of viral replication. J. Virol. 89: 4405–4420.
. 2003. HLA-B*0702 transgenic, H-2KbDb double-knockout mice: phenotypical and functional characterization in response to influenza virus. Int. Immunol. 15: 765–772.
. 2013. Targeted deletion of FGL2 leads to increased early viral replication and enhanced adaptive immunity in a murine model of acute viral hepatitis caused by LCMV WE. PLoS One 8: e72309.
. 2015. Lung CD8+ T cell impairment occurs during human metapneumovirus infection despite virus-like particle (VLP) induction of functional CD8+ T cells. J. Virol. 89: 8713–8726.
. 2011. RSV-induced bronchial epithelial cell PD-L1 expression inhibits CD8+ T cell nonspecific antiviral activity. J. Infect. Dis. 203: 85–94.
. 2011. Programmed death 1 regulates development of central memory CD8 T cells after acute viral infection. J. Immunol. 186: 6280–6286.
. 2013. Human metapneumovirus keeps dendritic cells from priming antigen-specific naive T cells. Immunology 139: 366–376.
. 2008. Respiratory syncytial virus impairs T cell activation by preventing synapse assembly with dendritic cells. Proc. Natl. Acad. Sci. USA 105: 14999–15004.
. 2009. Subversion of pulmonary dendritic cell function by paramyxovirus infections. J. Immunol. 182: 3072–3083.
. 2010. Effects of human respiratory syncytial virus, metapneumovirus, parainfluenza virus 3 and influenza virus on CD4+ T cell activation by dendritic cells. PLoS One 5: e15017.
. 2011. Transcription factor T-bet represses expression of the inhibitory receptor PD-1 and sustains virus-specific CD8+ T cell responses during chronic infection. Nat. Immunol. 12: 663–671.
. 2012. Progenitor and terminal subsets of CD8+ T cells cooperate to contain chronic viral infection. Science 338: 1220–1225.
. 2012. Activator protein 1 suppresses antitumor T-cell function via the induction of programmed death 1. Proc. Natl. Acad. Sci. USA 109: 15419–15424.
. 2006. Transcriptional regulator Id2 mediates CD8+ T cell immunity. Nat. Immunol. 7: 1317–1325.
. 2011. Repression of the DNA-binding inhibitor Id3 by Blimp-1 limits the formation of memory CD8+ T cells. Nat. Immunol. 12: 1230–1237.
. 2009. Transcriptional repressor Blimp-1 promotes CD8+ T cell terminal differentiation and represses the acquisition of central memory T cell properties. Immunity 31: 296–308.
. 2008. Molecular basis of the dual functions of 2B4 (CD244). J. Immunol. 180: 8159–8167.